Anyone can play Jenga all day without complaining about the woes. It’s a classic mind game played all over the world. However it is never said that you have to play this classic game in the classic style. The moment you see scattered Jenga blocks your mind may fill up with hundreds of ideas about how you can reinvest this game. Definitely there are ways to turn the game into mind blogging platform of creativity. Keep reading to create something new in the history of Jenna and shook the world with your creativity. 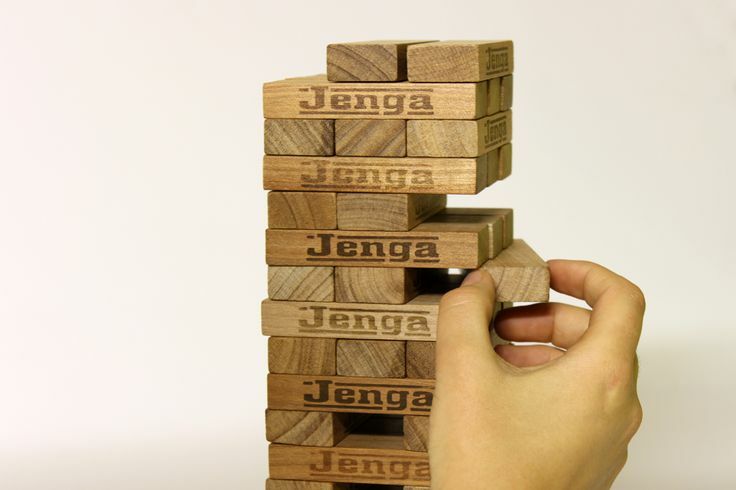 Joking, just check out some new fun ways to play Jenga. This is simple version in Reverse Jenga you arrange the bricks in the same log-home pattern. But this time instead of making the tower rise you aim at shrinking it. You take bricks from the top and insert it into tower in the lower part. You might find this reverse Jenga thing silly but you have no idea. Rules are the same to use only one hand. You have to challenge you opponent to make the same pattern shrinking the tower. The one who does it with fewer errors and in less time wins. Start with making a solid base. Use three blocks for this purpose. You can further reinforce the structure making use of other three blocks in other direction. Then you can go on to remove the middle block to achieve a perfect gap. Repeat the steps and you are good to go. Vertical Jenga tower building might raise some eye brows but you can very much enjoy playing this game. It is played as the classic version of the game but the difference is you have to remove the block of your choice and restack on the top. You have to make the same stacking pattern. Now challenge your competitor to stack up 3 more levels with same pattern on top of it. Make 5 blocks deep and 3 blocks across vertical pattern using bricks. Start building the same pattern again but rotate it 90 degrees, this will balance the tower more. However do not try to remove the bricks from the outer side as it will misbalance the tower. Always remove blocks from middle. Jenga is a team game and it is best enjoyed in company of friends who are as weird and interesting as you are. It is a sort of board game which is no fun to play alone. Do not limit your creativity to the variations shared here only. Make your own variation of game as it will be a lot more fun. Also people who find Jenga boring just after a month of playing it twice or thrice will also know the potential of the game. You can easily convert Jenga into a truth or dare game or to teach your kids how to do the house stuff. All it takes is your imagination and creativity. Secret Card In Cards Against Humanity: Where Is It Hidden?